For most of the past week, I’ve been moving southward from Puerto Iguazú to the Argentine Pampas, through moderate to occasionally heavy rains, before finally arriving at the “gaucho capital” of San Antonio de Areco, in Buenos Aires province, on Xmas Eve. 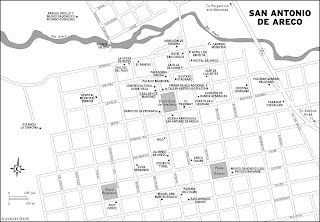 Most of the next day I spent exploring San Antonio, in the process of updating Moon Handbooks Argentina and Moon Handbooks Buenos Aires (in which the town appears as an excursion, only 113 km west of the Argentine capital). I was also writing up material from my travels since mid-November. Carlos Keen before continuing to Buenos Aires, but the night of the 25th it began to storm, with bright-as-day lightning and louder-than-fireworks thunder, so that I even disconnected the computer to avoid any potential electrical storm damage before going to sleep. When I awoke that morning, though, the ensuing downpour kept me from continuing to Buenos Aires, and the power had gone off in the vicinity of the central Plaza Arellano, where I was staying at the time. 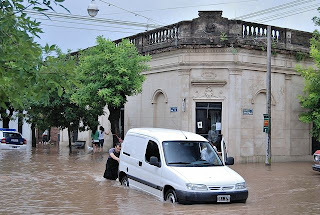 By the time it ceased raining, around midday, I learned that the Río Areco - which often floods in this low-lying terrain - had spilled over its banks and risen to within a block of the plaza. Matheu street, one block north, had itself become a knee-deep river channel. Ruta Nacional 8, which leads west toward Mendoza, was also underwater and it was even difficult to drive east to Buenos Aires. I decided to spend another night in San Antonio, despite the apparently rising river. I moved, however, to a handsome new two-room B&B, La Demorada, on slightly higher ground and, during the rest of the day, the river dropped slightly. Yesterday, meanwhile, westbound highways continued underwater, requiring major detours for anybody traveling toward Mendoza or Rosario, Argentina’s “second city” on the upper Río Paraná. Yesterday eastbound RN 8 to Buenos Aires dried out and I arrived in the city by early afternoon. There is some evidence that San Antonio’s floods may not have been an exclusively natural disaster, having been exacerbated by illegal drainage canals on ranchers’ pastures. As so often in Argentina, the search for villains - or scapegoats - is underway. My Moon colleague Christopher Baker’s recent post on Costa Rican howler monkeys has inspired me to respond from the Southern Cone. 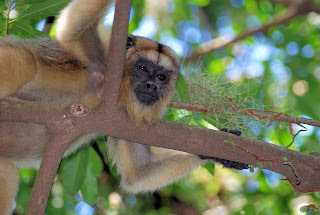 In fact, hardly anybody thinks of Argentina as monkey habitat, but the subtropical northeastern provinces of Corrientes, Misiones, Chaco and Formosa have significant if not abundant forest that supports populations of the black howler Alouatta caraya, which is also present in Brazil, Paraguay, and Bolivia. The easiest place to spot the black howler (the one pictured above is a juvenile) is the gallery forest across from the visitor center at Esteros del Iberá, just outside Colonia Carlos Pellegrini (the final destination of my recent 4WD adventure), in Corrientes province. On this short signed nature trail, you’re likely to come across the howlers and, if not, you may well hear them at night, as their calls carry across the waters of Laguna Iberá. 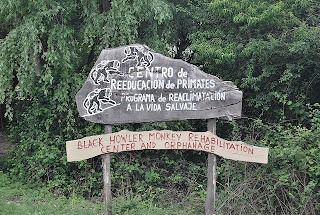 I had been to Colonia Pellegrini several times before but, in a recent drive through the Sierras de Córdoba, I also learned that there is a black howler rescue center near the town of La Cumbre. Most of the animals come from the pet trade, and the center accepts volunteers who want to work with them for a minimum of three weeks, "teaching monkeys to be monkeys." With four Moon Handbooks on my platter - Argentina, Buenos Aires, Chile and Patagonia - every year I spend four to five months, sometimes more, on the road as I update them. Except in Buenos Aires, where I own an apartment, I rarely spend more than two or three consecutive nights in the same bed during that time. Most of my travels take place in the southern hemisphere spring and summer, when most visitor services are open, and new editions of my books appear prior to the following season. I often say, for purposes of clarity, that I leave California when the World Series ends and return for opening day. That means I miss the northern hemisphere winter and spend the “holiday season” away from my family in California (though I occasionally spend it with my Argentine wife’s family in Buenos Aires province). In reality, though, being irreligious, I find this time of the year a distraction as my January/February deadlines approach. In particular, the dead week between Christmas and New Year’s can be a time when some tourist offices are closed and it’s otherwise difficult to do research. I do sometimes use that week to visit destinations such as Mar del Plata, the Buenos Aires province beach resort that becomes a zoo after the first of the year. Nevertheless, it’s sometimes nice to kick back, in countries where the sight of a snow-flecked Christmas tree and decorations like Santa Claus’s sleigh seem grossly out of place in, say, the subtropical heat of Puerto Iguazú or even the early summer streets of Buenos Aires. 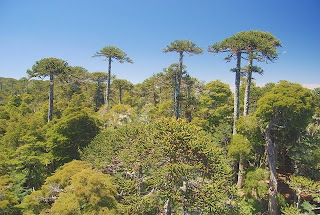 One of my most memorable December 25th’s I passed in Chile’s Parque Nacional Nahuelbuta where, if there were no symmetrical boreal firs covered with colorful ornaments, there were forests of equally symmetrical austral Araucaria (monkey puzzle) trees with no need of ornaments. And I was literally the only person in the entire park. 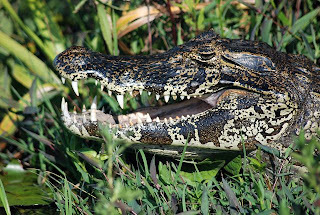 One of Argentina’s greatest underrated and underappreciated sights is the Esteros del Iberá, a slow-flowing river of wildlife-rich floating islands in the northeastern province of Corrientes. It’s the place to see capybaras - rodents the size of a Rottweiler - and caimans, marsh deer and hundreds of bird species, up close and personal. The problem is getting there. To the village of Colonia Carlos Pellegrini, where services into the these marshes are best, the easiest access point is the west-side town of Mercedes, 120 km from Pellegrini, but Mercedes itself is 230 km from the nearest airport, or an overnight bus ride from Buenos Aires. The Misiones province capital of Posadas, to the northeast, is closer, but the eastern segment of provincial Ruta 40 from the town of Gobernador Virasoro is virtually impassable during or after a rain. Yesterday I was driving from the Argentine border town of Puerto Iguazú, near the famous Iguazú falls. I would pass near Posadas and, because circling the Esteros to Mercedes would have added an extra 320 km to a 550-km drive, I decided to brave Ruta 40. 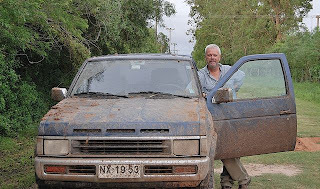 Taken in Colonia Pellegrini, the photograph here marks the end of the story, but my mud-splattered truck - note the chunks of mud on the roof - doesn’t tell everything. At the junction with national Ruta 14, the well-traveled paved highway to Buenos Aires, a sign warns prospective drivers that Ruta 40 is closed in wet weather. Ever since I left Puerto Iguazú there had been high clouds, but darker, lower ones were forming to the west toward the Esteros. A hotel owner in Puerto Iguazú told me the route had been good, except for one sandy 23-km stretch, when he had driven it a few months earlier. At the beginning, the route was smooth, supporting speeds up to 80 km per hour, and I was somewhat confident that, even if it began to rain, it would take some time to make the route impassable. After about 20 km, though, lightning flashes appeared to the west and, before too long it was a hard rain, if not quite a downpour. The surprise was that even this brief rain turned the road to a brown slush and, in no time, chunks of mud were flying onto the hood and even the roof of the truck. I engaged my 4WD immediately. Mud was also accumulating on the underside of the chassis as I slipped and slid on tracks left by previous vehicles - the least uncertain means of continuing. By the time those tracks disappeared, there was no turning back, and I took to driving with one set of wheels on the mostly grassy shoulder - but perilously close to water-filled drainage ditches. My speed dropped to about 20 km and, on more than one occasion, I was advancing diagonally along the edge of the road. Two or three times, I was so stuck in the mud that I had to rock back and forth between first gear and reverse to get out of a wallow that, it seemed, would have held a hippopotamus. Fortunately, the rain stopped and the conditions never got any worse, though I did pass through areas approaching Colonia Pellegrini where it might have rained harder, and one long but slight uphill stretch was particularly difficult. After about four hours, mentally exhausted, I had covered the 120 km to Colonia Pellegrini and taken a room at Rancho Ypa Sapukai, a comfortable, moderately priced guesthouse that also offers excursions into the marshes.. In reality, I was never in any particular danger - sooner or later a tractor from a neighboring farm would have pulled me out of the muck - but I had no desire to spend a hungry night sleeping inside the truck. And at least I learned that the eastern segment of Ruta 40 is impossible for an ordinary passenger car, and difficult enough even with 4WD. Nevertheless, owner Pedro Noailles of Ypa Sapukai is taking two passengers to Posadas today over the road - a transfer that now costs from 700 pesos (nearly US$200) for up to four passengers. Considering the route’s difficulty, rising fuel prices, and the distance to Posadas, this is not an unreasonable cost, especially considering that the driver and vehicle have to return. For my part, after a wildlife-watching excursion today, I’ll be heading west tomorrow toward Mercedes on the all-weather access segment of Ruta 40. I’m not sorry I drove the eastern segment yesterday, but I’ll likely never do it again - unless the weather is perfect or the province paves the road. The Highway Hazards of Argentina's "Four Corners"
Northwestern Argentina, where I have spent most of the past two weeks, is one of my favorite parts of the country. In both geography and culture, it resembles the southwestern United States, with polychrome deserts canyons and a strong indigenous presence. 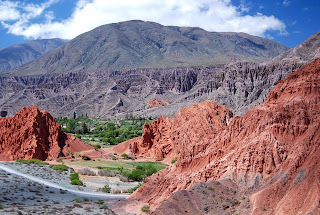 The provinces of La Rioja, Catamarca, Tucumán, Salta and Jujuy possess overpowering scenery and a cultural heritage that traces its origins back to highland Peru and Bolivia. The steep-sided box canyons of La Rioja’s Parque Nacional Talampaya have been a UNESCO World Heritage Site since 1997, and Jujuy’s Quebrada de Humahuaca was declared one in 2003. The latter, in particular, has seen a major influx of tourist investment and infrastructure. Yet this is also one of the areas that makes me most nervous. It is one of the country’s poorest regions, with serious urban and rural poverty. I have never been concerned about crime here, but scofflaws do bother me and that’s because, like many foreign visitors, I often drive a car to reach the most remote and scenic places. That also means, on occasion, that I have to drive in congested provincial capitals where motorcycles and scooters are constantly darting and weaving among automobiles, buses, and trucks. 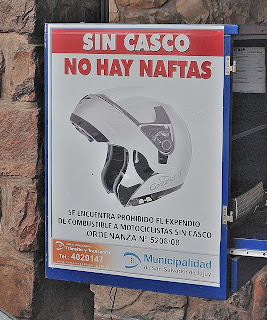 In theory, Argentine law obliges the drivers of motorcycles and scooters to wear protective helmets but nothing, apparently, obliges them to wear them on their heads - it’s not uncommon to see riders loop them over their elbows. I estimate compliance at less than one percent, and the provincial police appear to have zero interest in enforcement. Yet it’s not solitary adult bikers that concern me so much as poor families who have scraped together enough money to buy an underpowered motor scooter that they use to get around town - I have often seen a family of four or five, with babes in arms, careening through town with no head protection whatsoever. Given their precarious equilibrium, a major tragedy is only a small oil slick away, as they could easily tumble in front of my - or your - oncoming car. Some of these drivers are not even licensed - one Catamarca transit policeman told me that it’s common for fathers to give their daughters a scooter for their quinceañera (15th birthday) celebration. In one recent case, the result was an immediate traffic fatality well before the daughter had reached driving age. 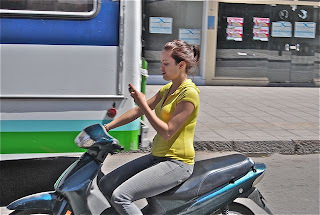 When someone’s simultaneously texting on a cell phone, as depicted here, the hazard is even greater. What explains the failure to enforce the law? It’s complicated, but there are also many junk cars, highway hazards that could not possibly pass any technical inspection because of missing headlights and other defects, that are nevertheless on the road. The usual explanation is that federal and provincial governments would rather keep “social peace” than enforce laws that may “discriminate” against poorer people. In reality, though, this endangers those very people the law supposedly exists to protect. It’s also bewildering, of course, that so many riders seem to have so little regard for their own - and their children’s - personal safety. According to a recent press release from Ethical Traveler, an organization headed by my Oakland neighbor Jeff Greenwald, both Argentina and Chile figure among the ten most ethical destinations for world travelers in 2010. Given where these countries would have figured 30 years ago, when both were under vicious military dictatorships, this is a welcome development though, in the following paragraphs, it will be apparent that the analysis is not quite so simple. In all these categories, though, there is room for devil’s advocate arguments. 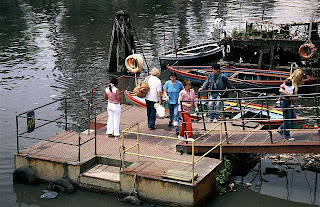 In Argentina, for instance, the government may have pledged preservation of endangered Atlantic forest in the northwestern province of Misiones, but at the same time it’s lagged far behind in cleaning up the Riachuelo, a stagnant stream of sludge that runs through the tourist-friendly Buenos Aires neighborhood of La Boca (pictured above). Chile deserves credit for its progressive national parks system but, outside park boundaries, monocultural plantations of exotic Monterey pine often continue to replace native forests. 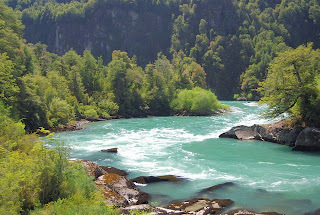 Controversial, massive hydroelectric projects threaten areas the Río Futaleufú (pictured here) and other rivers without formal protection in northern Chilean Patagonia. Both Argentina and Chile, of course, suffer from great disparities between wealth and poverty, both in the cities and the countryside. Chile has dealt with this in a more systematic manner, providing assistance and opportunities within an institutional framework. Argentina, meanwhile has often tied assistance to political patronage, in both urban and rural areas. In some ways, this has made existing problems worse. While the political environment in both countries is far superior to what it was three decades ago, it’s not without problems. Perceiving its ebbing support to be a result of an unfriendly press, for instance, the Argentine government of President Cristina Fernández de Kirchner forced adoption of a new media law aimed at the Clarín group, its most outspoken opponent. In another irony, Chile has invoked a Pinochet-era anti-terrorism law against Mapuche Indian demonstrators (some admittedly violent) in the southern lakes district. All of this is not to imply that Argentina and Chile are unsuitable destinations for travelers concerned with how the proceeds from their travels will be spent. As it happens, I agree with most of Ethical Traveler’s conclusions, but that doesn’t mean that visitors to these countries should overlook their shortcomings. That’s part of the learning experience. Last month, as I was motoring down Interstate 5 in a rental car to catch my flight from Los Angeles to Santiago the next day, I pulled off the highway to receive a phone call from John Bordsen, the travel editor for North Carolina’s Charlotte Observer. After a couple lost connections, I found a high point where the phone signal was dependable, and John interviewed me on Chile for about half an hour, focusing on the new third edition of Moon Handbooks Chile. The condensed interview finally appeared in last Sunday’s Observer. 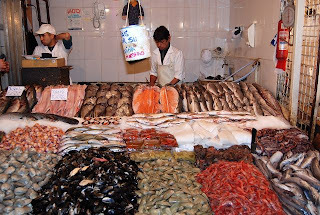 Surprising, John was most interested not in Torres del Paine and the Atacama desert - the prime destinations for most visitors to Chile - but in the capital city of Santiago (with sights such as the Mercado Central and its fishmongers, pictured above), the colorful port city of Valparaíso, and the Casablanca valley wine country. You can read the entire interview by clicking on the link at the beginning of this paragraph. Many hotels claim, at least figuratively, to treat you like a king. 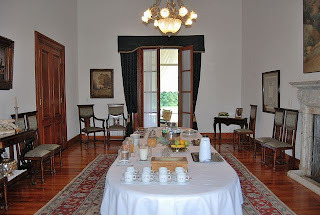 Only one, to my knowledge, can legitimately claim to treat you like a president - Estancia La Paz near the village of Ascochinga, about 45 minutes north of the Argentine provincial capital of Córdoba. In Argentina and Uruguay, and to a lesser degree in Chile, estancias are large landholdings - often measured in hundreds or even thousands of square miles - linked to a traditional “oligarchy.” In most of Argentina, they are cattle ranches, though in the southerly Patagonian provinces they are usually sheep ranches. Over the past couple decades, as livestock raising has proved less profitable than in the past, many of them have opened their doors to paying guests, just as dude ranches did in the United States from the late 19th century. Estancia La Paz, where I spent a recent weekend, once belonged to Julio Argentino Roca, the military man responsible for the so-called Conquista del Desierto (“Conquest of the Desert”) that drove the native population of southern Buenos Aires province into Patagonia in the late 19th century. Roca also served two terms as Argentina’s president, and Estancia La Paz was where he went to get away from it all. 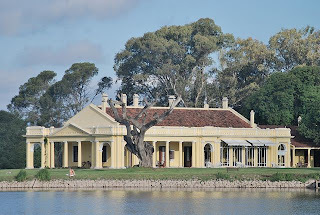 Today, no longer in the Roca family, the former casco (big house, dating from 1830) is a 20-room hotel on sprawling grounds that include an artificial lake (which attracts many birds), polo grounds, a stable (for non-polo riders as well), a spa, and a fine restaurant that’s open to non-guests by reservation. In 1994, the Alvears, descendents of the Rocas, sold it to Italian interests who neglected the casco and sold off many of the original furnishings. The Scarafia family of Córdoba, who purchased it in 1998, have managed to assemble a credible collection of antique furnishings that at least recreate the feeling of Roca’s heyday. In addition to the estancia, local attractions include the Sierras de Córdoba, where hiking and other outdoor activities are possible, and the Jesuit monuments near the town of Jesús María (which is home to January’s Festival de Doma y Folklore, a nationally televised festival where gauchos engage in bronco-busting and the country’s top folk musicians play). 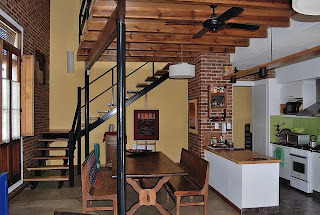 For all this, Estancia La Paz is surprising affordable at about US$130 per person for bed and breakfast, with lunch or dinner for about US$20 (with a sophisticated menu that changes daily). Roca’s “Camp David” comes cheap, at least for anyone with frustrated presidential ambitions. Last year, about this time, the dollar was riding high in the Southern Cone countries, having reached a peak well above of 600 Chilean pesos. It was also climbing against the Argentine and Uruguayan pesos, so that traveling in the region was a bargain. In a year, though, things have changed, especially in Chile. As the country comes out of the economic crisis - deftly managed by President Michelle Bachelet and her team - the price of copper has rebounded and there’s been an influx of dollars into the country. Thus the dollar has fallen below 500 pesos, with the end result that prices have risen by about 20 percent, even though Chilean domestic inflation remains low. Chilean agricultural exporters are complaining, as their domestic costs remain high, but they receive fewer dollars for their fresh fruit, wine, and other products. So are incoming tourism operators, who receive their income in dollars, but have to pay their salaries and other expenses in pesos. That said, not everything is negative in Chile. 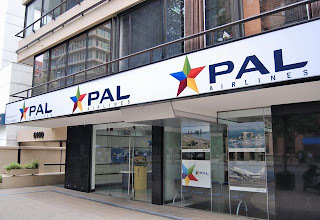 The new Principal Airlines is attempting to undercut the established carriers LAN Airlines and Sky Airline on routes to the northern cities of Antofagasta, Calama, and Iquique. How long they may last is open to question - LAN’s resources and services have put several other Chilean airlines out of business over the past couple decades - but for the time being this means potentially cheaper access to Atacama desert attractions such as San Pedro de Atacama (near Calama), the nitrate ghost towns of Humberstone and Santa Laura (near Iquique, which also has some of Chile’s best surfing), and Lauca National Park (in the Andean altiplano east of the city of Arica). Travelers with those destinations in mind may be able to minimize their financial sacrifice. In Argentina, meanwhile, the dollar has strengthened against the peso, despite a recent minor drop. A year ago, it was at the 3.2 peso level and, today, it’s right around 3.8 per dollar. That’s not to claim Argentina is necessarily cheaper than it was then, as prices of some items such as gasoline and taxi fares have risen - in fact, realistic price rises were long overdue. 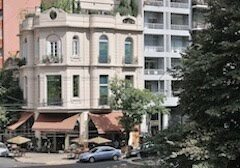 Yet it’s still possible to find good values in hotels and especially in restaurants, where good meals are available for US$10 per person, and spending a bit more can mean something really memorable - especially in the Buenos Aires gourmet ghetto of Palermo. Even at restaurants, wines are a phenomenal bargain, with full bottles of fine wines available for what, in the United States or Europe, would barely cover the cost of a glass. Those who wish, though, can still spend hundreds of dollars on a truly premium vintage.